We’d love your help. 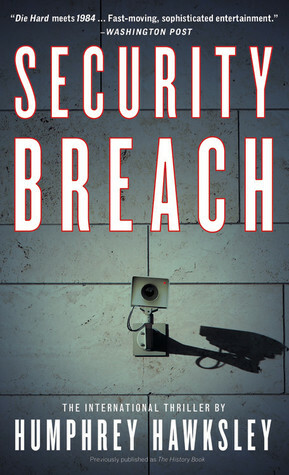 Let us know what’s wrong with this preview of Security Breach by Humphrey Hawksley. "High-stakes, high-octane thriller...my kind of book." When you move, they watch. When you speak, they listen. They track you by what you touch and how you walk. Welcome to the not-so-distant future, where terrorism is so feared that near-total surveillance is a way of life. In Washington, a young American agent, Kat Polinski, is on a routine assignment: break "High-stakes, high-octane thriller...my kind of book." To ask other readers questions about Security Breach, please sign up. Not believable, not captivating, not impressive. The characters and weak and the plot is made complex just for the sake of it. Nothing memorable. Not one name, not one character, not one scene. Too long and convoluted. It is beyond belief that one person can survive that many encounters. Too long and convoluted. It is not believable that one person can survive that many encounters. No one is that good. 2 stars looks bad ..but as per Goodreads "it's ok" , so was the novel . The protagonist Kat polanski is a rich young girl who is a hacker , gets trapped by Govt. and in many dangerous situations . The plot was good i would say - Spies + Oil, Big powerful firms + Russia + Terror Hype + Privacy but the treatment wasn't ,given the fact the author was a BBC journ 2 stars looks bad ..but as per Goodreads "it's ok" , so was the novel . The protagonist Kat polanski is a rich young girl who is a hacker , gets trapped by Govt. and in many dangerous situations . The plot was good i would say - Spies + Oil, Big powerful firms + Russia + Terror Hype + Privacy but the treatment wasn't ,given the fact the author was a BBC journalist , and must have explored he characters/events more. This is a highly exciting, action-packed novel that I couldn’t Fast-paced, intelligent, intriguing, and suspenseful! A real thriller with lots of action and good guys are bad guys are good guys are bad guys. Kat Polinski, the protagonist, is one very resourceful and determined lady. Lots of interesting secondary characters. Hawksley writes an exciting thriller. He is writing about what he knows through his day job. I was given a digital copy of this book by the publisher Endeavour via Netgalley in return for an honest unbiased review. This was a ok read. My main problem was I just could not engage with the main characters and therefore it was a real struggle to keep reading. The end of the story left a lot of loose ends but was a relief to myself. Humphrey Hawksley is a journalist and an author who has been a foreign correspondent for the BBC since the early 1980s. Hawksley was educated at the Junior and Senior schools of St. Lawrence College, an independent school for boys (now co-educational), in the coastal seaside town of Ramsgate in Kent, in south east England. After school, Hawksley joined the Merchant Navy, and sailed across the world. Humphrey Hawksley is a journalist and an author who has been a foreign correspondent for the BBC since the early 1980s. After school, Hawksley joined the Merchant Navy, and sailed across the world. He joined the BBC in the early 1980s. In 1986, Hawksley was expelled from Sri Lanka where he had reported on a number of government atrocities in its conflict with Tamil separatists. In 1987 he covered violence in the Philippines and received death threats. In 1989 after the killings in Tiananmen Square he went to Hong Kong and reported on social stresses due to the country’s imminent transfer to Chinese rule. He was simultaneously a reporter for the whole of Asia. He later covered this transfer live in Beijing. In 1994, he opened the BBC’s first television bureau in China. Humphrey Hawksley reported on fighting in The Balkans, Iraq and Timor Humphrey Hawksley has also reported on slavery in cocoa production. Hawksley has written extensively in Newspapers including The Guardian and The Times. Hawksley is also the author of best-selling political novels aimed at raising key strategic issues in the far east before a broader audience. These include Dragon Fire, Ceremony of Innocence, Absolute Measures, Red Spirit and co-author with Simon Holberton of Dragon Strike. His latest books are The Third World War, The History Book and "Democracy Kills: What's So Good About Having the Vote? ".